Mitel has been an interesting player in the space to watch over the past year. 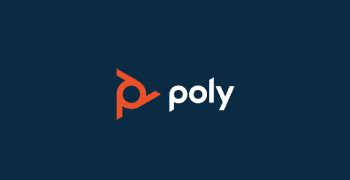 We’ve seen Mitel almost join forces with Polycom in what was seen as a major disruption, but then saw the same proposition fall out a few months later. More recently, we’ve seen Mitel both shedding weight and acquiring new mobile focused initiatives. We’ve even seen Mitel double-down on hardware and put together their own compelling take on desk phones, integrating both the modern IP desk phone and smartphones. Other than that, though, we’ve been slightly in the dark as to what exactly Mitel has up their sleeves. Today, Mitel hosted its annual Analyst Day, and a number of executives took the stage to present their latest plans for the future of Mitel. We wanted to highlight some of the key takeaways that might influence businesses owners searching for a new provider. CEO Richard McBee first took the stage to kick off the presentation, and started on a high note. This could be an obvious reference to Mitel pulling back from the Polycom acquisition when they were outbid, but of course it could also be McBee’s general statement on Mitel’s acquisitions in the future. The key point, though, is that Mitel is going to be making educated acquisitions — not just scooping up what they can and overpaying in an attempt to come out on top. 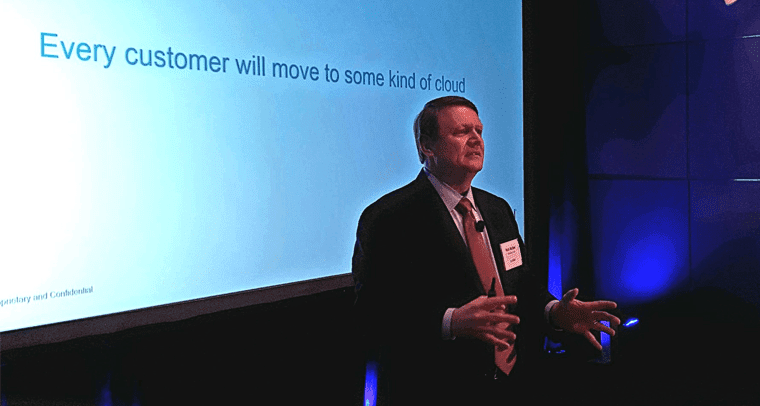 The other main takeaway from McBee’s statement is Mitel’s undergoing digital transformation to a primarily cloud-focused provider with its technology built in and on the cloud. Mitel wants to offer a platform that provides the experience users have come to expect and that users need to seamlessly collaborate. We all know how important team messaging and collaboration solutions have become. Moving forward, Mitel’s vision is to “make communication and collaboration seamless.” The provider hopes to deliver solutions “that enable our customers to securely communicate and collaborate anywhere, over any medium with the devices and applications of choice.” If this sounds familiar, it’s because it is. 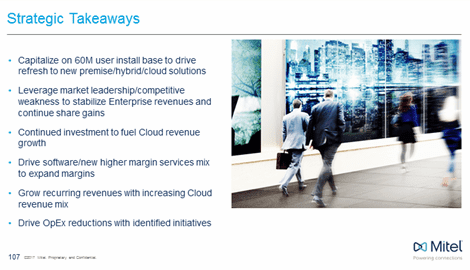 This is the entire premise that cloud technologies enable, and it’s good to see Mitel focusing on where the market is going. 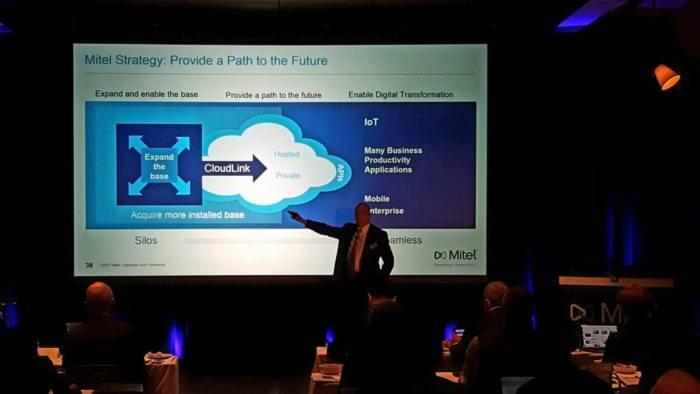 McBee also explained how Mitel is looking to focus on more vertically-oriented channels in the future, and even expand into both emerging IoT and business productivity markets. This makes me wonder: what kind of collaboration app will we see from Mitel? We’ve already seen Amazon launch Chime and step up to the plate. We’ve also seen how the new Zang platform from Avaya, one of Mitel’s closest competitors, will help advance their offerings into a more modern approach. Mitel is undergoing a digital transformation, looking to quickly migrate everything into the cloud. 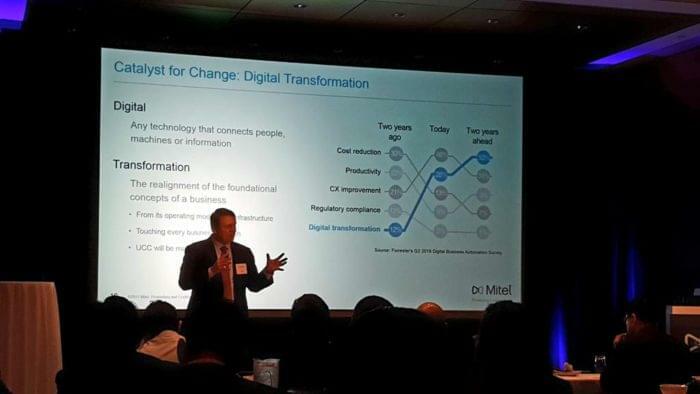 Mitel is well-positioned to lead a digital transformation with its existing customer base, technology stack, and global presence. New vertical applications will help differentiate companies, such as slimming down CRM offerings into one specific vertical. This isn’t me putting words into Mitel’s mouth just to focus on the modern approach. Bob Agnes, EVP and President of Mitel’s Enterprise Division, took the stage after McBee to further explain Mitel’s vision of the future. Mitel recognizes that this new workforce and the new technology trends are coming together to not only create new opportunities, but completely revolutionize how we work and collaborate. This almost echoes my thoughts from my recent breakdown of how to navigate the crowded ocean of team messaging apps. These applications are falling in line with how the new workforce expects to communicate. They’ve been doing it forever. Mitel is looking to shift from a siloed approach into a seamless experience with overlapping solutions. Agnes offered discussion on how Mitel is well positioned for this future of communication, both with their global footprint and wide range of solutions. Mitel can position their solutions in public, over-the-top applications for the smaller business that simply needs a system, or private clouds for the midsize to large business that requires an extra level of security (even more than just a simple firewall for your network). The provider will be taking a “customer centric” view. 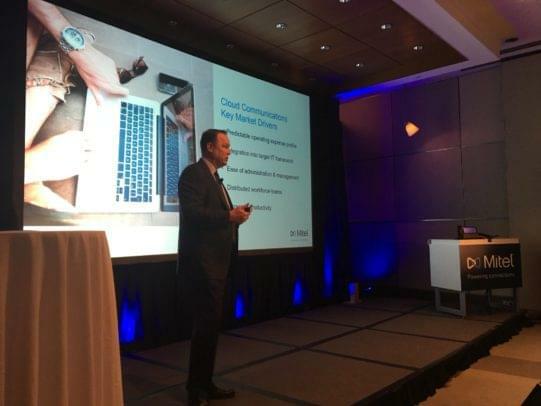 Jon Brinton, the Cloud Division President and EVP, explained that Mitel recognizes the specific needs of differently sized organizations. He even touched upon multinational companies as an interesting area of growth for the provider. The company will also leverage its existing leadership to drive adoption and competitive costs, but also help stabilize Mitel itself as a provider. The future differentiator in providers will simply be the applications provided to customers: those that offer a more productive and efficient platform will rise to the top. A strong global footprint and depth of solutions positions Mitel to offer the right solution, at the right segment, in the right location. 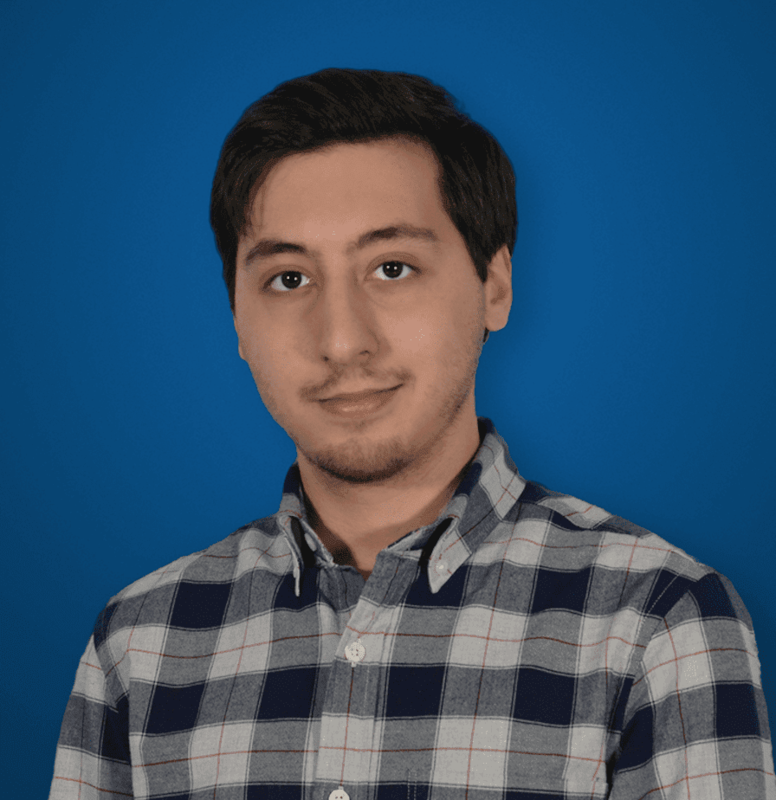 Mitel focuses on providing not just another UC app and a simple API, but rather a platform that offers an extensive API, client SDK, business logic, and a strong focus on the user experience. Mitel recognizes the adoption of solutions is driven by the experience and simplicity it provides. If a product is complicated, it makes our work days harder, and won’t be used. Mitel looks to be positioning itself in the right way by drawing upon their strengths and recognizing where the market demands innovation. Mitel also recognizes where and how they need to shift their focus. So, good for Mitel for understanding the shift away from legacy to digital. 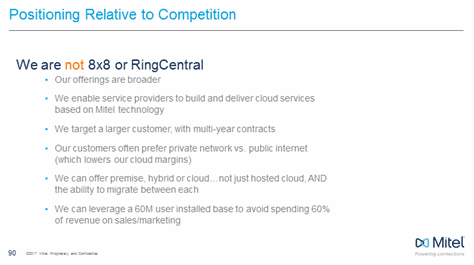 One specific slide I noticed was Mitel distinguishing themselves from those they are not, such as RingCentral and 8×8. The provider clearly sees themselves in a different place in the market, both financially and strategically. Agnes was quick to say that Mitel is in an interesting place in the market, and their “competitors are falling apart to some degree.” Which is funny, because we compared them to ShoreTel previously. With their strong focus on a broader set of offerings, a platform for service providers to build their own services, and larger customers with multi-year contracts, Mitel clearly sees themselves as being a rung above their competitors. It will be interesting to watch their transition and see how well they can deliver on their projections. It will all come down to a unique price point, with a solution that innovates where others fall short. That’s been a pretty heated battle for a while now, so we’re very interested to see where it goes from here.